59% are already mothers (including those who had children in high school and during college). 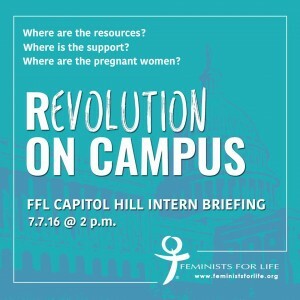 Feminists for Life, the leading advocate inspiring pro-woman, pro-parent resources on campus, invites student activists to hear from women who know firsthand the lack of choices on campus. Come and be a part of the revolution to give women the resources and choices they are missing! and FFL member Johanna Young, a victim of domestic violence who was coerced into an abortion while in college. We will also have an administrator from a major university talk about developing on-campus resources and support. And Kara Sorenson will share remarkable results after hosting the most recent FFL Pregnancy Resource Forum at Clarion University. We look forward to working with you and providing you with the latest tools, so you, too, can be part of our Revolution ON CAMPUS! Seating is limited for this intern briefing. College and university press journalists are also welcome, but let us know that you’re coming, too! RSVP now to info@feministsforlife.org.Refreshments will be served! Not a college student? We really need your support for this event. Please give right now! Thank you for making this event possible. Not in the Washington, D.C. area? Share this event on Facebook! And while you are there, ask to join our NEW Feminists for Life on Campus group. It’s a closed group for college student activists only so we can discuss ideas and share free materials. PS: Fall telecommuting internships and other volunteer opportunities are available!